When Richard Ardagh was a child, he attended St Clement Danes School in Hertfordshire and once a year the whole school went down to the church of St Clement Danes in the Strand for a special service to commemorate their founding by the churchwardens in 1844. One of the songs they sang every year was “Oranges and lemons say the bells of St Clements…” a traditional rhyme referring to the different peals of bells at six churches in the vicinity of the City of London. Everyone knows the game in which the singers file in pairs through an arch made by two players facing each other and on the final word ” …dead” they drop their arms to trap the pair passing through. This pair form another arch, so you get a line of arches and intensifying experience for those left in the game. There has been enormous speculation about the origin of this, including child sacrifice, public executions and Henry VIII’s marital strife, but these final lines are not present in the earliest printed version of 1744 in Tommy Thumb’s Pretty Song Book, suggesting they were added later : Two Sticks and Apple, Ring the Bells at Whitechapple / Old Father Bald Pate, Ring the Bells at Aldgate / Maids in White Aprons, Ring the Bells at St Catherines / Oranges and Lemmons, Ring the Bells at St Clemens / When will you pay me? 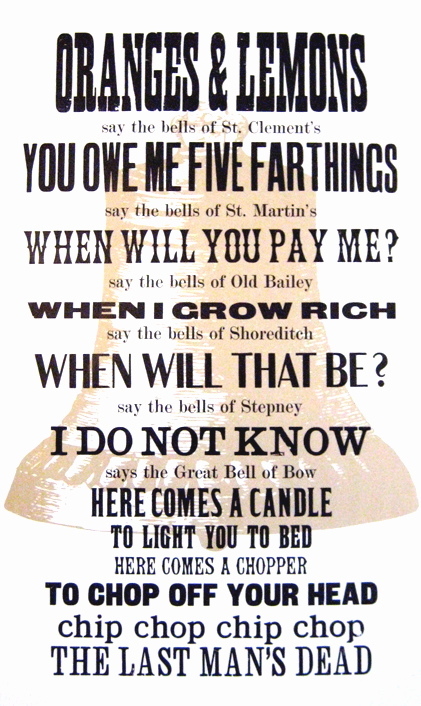 Ring the Bells at Old Bailey / When I am rich, Ring the Bells at Fleetditch / When will that be? Ring the Bells at Stepney / When I am old, Ring the Bells at St Paul’s. Many years after leaving school, and studying Fine Art and then Graphic Design at Central St Martins, Richard Ardagh found himself living by Brick Lane in Bacon St and, passing St Leonard’s Shoreditch regularly, the rhyme came back into his mind. So when the possibility of collaborating with Graham Bignell at the New North Press came up, it was a natural choice to make a print of “Oranges and lemons…” and they discovered they had tapped into something popular because the limited edition of 150 sold out. “We found we both shared an interest in East End history, and nursery rhymes seemed a good starting point – things that were in the common consciousness but that people didn’t know what they meant”, Richard told me when I visited him at the New North Press in Coronet St beside Hoxton Sq last week, as we stood chatting between the magnificent Albion Printing Press and the drawers of Graham Bignell’s precious collection of wooden type stacked up to the ceiling. This was the press they used to print “Oranges and Lemons…”, though the ambitious scale of the print itself (over a metre high) required printing the text in two separate panels and putting the paper through the press twice. Richard clearly relished the opportunity to try out some of Graham’s historic display faces. “Showing off typefaces gives you an excuse to use different tones of voice, it was almost a conversation”, he said, enthusing about his collaboration with Graham whom he spoke of reverentially. “I think of it as an apprenticeship in letterpress”, he added before lapsing into silence as he placed a piece of paper in the press. It was a privilege to observe the atmosphere of the printers at work. A thoughtful, slightly built man, softly-spoken, with short curly blonde hair, a straggly beard and long fingers, Richard cuts an almost monastic figure working here at the press with quiet concentration. And when he pointed out a picture on the wall of William Morris working in his printing shop, that he likes to keep in the corner of his vision, I realised that Richard would be completely at home there. Richard and Graham chose to follow the success of “Oranges and lemons…” with a second large letterpress print, “Pop! 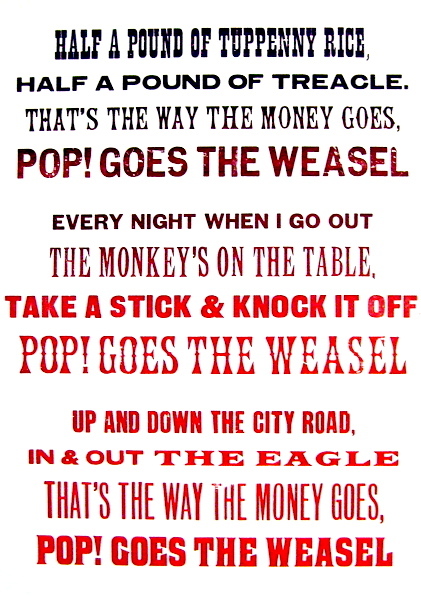 goes the Weasel”, another rhyme with an East End connection. “I cycled past the Eagle every day, so I found myself humming it!” admitted Richard. “Pop” means to pawn and “weasel” is Cockney rhyming slang, “weasel and stoat” for coat. With raffish unsentimental humour, this nursery rhyme, about pawning a coat to buy drink, speaks of a life of poverty that was the commonplace in this neighbourhood in the mid-nineteenth century when it originated. If you go to the Eagle in Shepherdess Walk beside the City Rd, which was established as a music hall in 1825 and rebuilt as a pub in 1901, they still have the text on the bar room wall. Chip chop, chip chop the last man’s OUT. There is a marker b etween Orange and Lemon. Orange and lemon drop arms, imprison the child with the word OUT and whisper who do you choose, orange or lemon? Child chooses then stands behind his chosen leader. When all the players have chosen, there is a line behind orange and b ehind lemons. Then there is a tug of war between the orange and the lemon sides. Whichever sides pulls the other over the marker, WINS. Gilda Moss Haber, PhD former EastEnder see my book, Cockney Girl second edition.